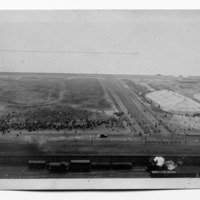 This aerial view of Grant Park was possibly photographed from the Peoples' Gas Company building (completed in 1911) with Monroe Street going to Lake Michigan at the top. An alternative vantage point is from the top of the Railway Exchange Building, with Jackson Boulevard going toward Lake Michigan at the top. At the bottom of the photograph are several pieces of railroad equipment on the Illinois Central tracks below grade: a steam engine, freight caboose, and a number of freight cars. This is one of Bennett's study views capturing moments of the future Grant Park space, at that time an undeveloped fairgrounds. Bennett, Edward H. (Edward Herbert), 1874-1954 , “Grant Park, aerial view, including the Illinois Central Railroad tracks,” Digital Collections - Lake Forest College, accessed April 26, 2019, http://collections.lakeforest.edu/items/show/1902.